The “poet-naturalist” was born in Concord, Massachusetts, of French-Scottish-Quaker-Puritan heritage. When he was only twelve, Thoreau prepared nature collections for scientist Louis Agassiz. His older brother, John, paid the cost of his years at Harvard College, Class of 1887. The brothers then taught school together in Concord, but Henry resigned when he was forced to flog students. Among those who influenced him were the metaphysical poets, as well as Bronson Alcott and Jones Very. Thoreau lived simply, earning income by surveying and making pencils. While living at Walden, he wrote a book about his trip with his brother: A Week on the Concord and Merrimac Rivers. When Henry was twenty-five, John cut himself while shaving and died of lockjaw while held in Henry’s arms. When living in the Emerson home for two years, Thoreau helped as a handyman but was also a member of the historic Transcendental Club. While a tutor in the Staten Island home of William Emerson, he became acquainted with Horace Greeley, Lucretia Mott, and the elder Henry James. When he lived for two years in a hut that he built by Walden Pond, he not only raised beans and potatoes but wrote his most famous book, Walden. 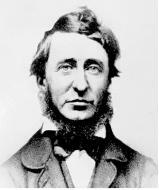 Thoreau was imprisoned when he refused to pay a poll tax used to support slavery and the war with Mexico. In his essay on Civil Disobedience cherished by Leo Tolstoy and Mahatma Gandhi, he declared: “That government is best which governs least.” In that spirit he helped American slaves escape to Canada. This mystical natural and political philosopher and writer knew Nathaniel Hawthorne, Margaret Fuller, and Theodore Parker. Two books that tell of his trips are The Maine Woods (1864) and Cape Cod (1865). His Journal of the days of his life contained two million words and was published in twenty volumes. His address on “Slavery in Massachusetts” praised the militant abolitionist John Brown. When Thoreau visited Walt Whitman in New York City in 1850, he was given a signed copy of Leaves of Grass. Thoreau’s own poems were seldom highly honored except for an early appraisal by Emerson, but in 1983, Carl Bode gathered a volume of the entire Collected Poems. This poet, a lover of life who was a true original, died of tuberculosis at the age of forty-five. His intimate friend, William Ellery Channing II, the nephew of the noted Unitarian minister, wrote the first biography: Thoreau, the Poet Naturalist. His hands may gather for his winter’s store. Offering its slopes to his unwearied knees! And yonder too the fair green prairie. While the stern Winter reigns on northern hills. The so long gathering congress of the world! And manly Saxon, leading all the rest. A pause in the long weltering caravan.